Welcome to Jeremy Larson's MWOY Fundraising Page! The fight to cure blood cancers starts now! I have been given the opportunity of a lifetime but I cannot do it without you. Each year, The Leukemia and Lymphoma Society (LLS) launches a Man & Woman of the Year (MWOY) fundraising campaign. I was presented with the opportunity to be a candidate for the 2018 Man of the Year Campaign. I am excited to share with you that on November 10th, 2017, I accepted my nomination - I need your help! The Leukemia & Lymphoma Society's (LLS) Man & Woman of the Year campaign is a fundraising competition to support blood cancer research among a group of motivated and dedicated individuals in communities across the United States. I’m running in honor of the Minnesota Chapter among 14 other candidates! Each dollar raised counts as one vote. The male and female candidates who raise the most votes during the campaign are named Minnesota Chapter's Man & Woman of the Year at the Grand Finale Gala on May 19, 2018 -- SAVE THE DATE!!! § You can donate on my website NOW! § You can make a donation for the Grand Finale Gala live or silent auction. ² Each candidate can donate up to 10 items for the live and silent auction. All proceeds from the silent auction items that I donate will go towards my campaign. I am looking for gift cards, spa packages, vacations packages, celebrity outings, tickets, autographed items etc. All of your donations will go directly to LLS in support of its longstanding goal: A world without blood cancers. I am extremely excited and honored to be part of this campaign for there is much progress being made towards beating cancers with the dollars it raises. More than 40% of new cancer therapies approved by the FDA between 2000 and 2015 were first approved for blood cancer patients and many of these LLS-supported therapies are now approved to treat patients with rare forms of skin and stomach cancers, noncancerous diseases and many other autoimmune diseases. I am asking you to reach out to others you know and ask them to do the same. I have found that so many people I talk to about our efforts have a connection to cancer and want to be involved. It is unfortunate that cancer touches so many of us but together, we can find a CURE! I greatly thank you in advance for your support for this incredible need and I will keep you updated on the progress of my campaign. For now, I am grateful for your friendship and support. THE FIRST 50 PEOPLE TO PURCHASE TICKETS TO THE MIRACLE PARTY WILL GET A FREE $15 GIFT CARD TO THE EXCELSIOR BREWERY!!! 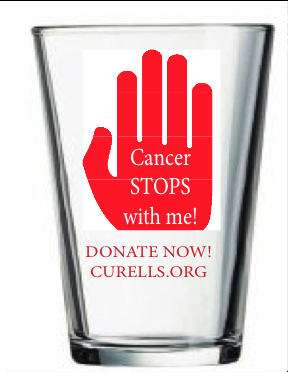 Your ticket includes a "Cancer STOPS with Me" glass, pizza from Joey Novas and two prize drawing tickets!